My reviews are based on the shoes that runners wear in, and the Instinct is the only shoe I’ve seen from Altra. In this runner’s case, he purchased the Instinct based on it’s “wider,” more supportive appearance, only to develop forefoot pain. Altra’s website promotes Altra zero-drop footwear as “reducing forefoot pain, excessive pronation, IT Band pain, runners knee and shin-splints.” These claims are made independent of Altra model or style, but are instead specific to the zero-drop platform. So, based on these general design claims, this particular shoe should have worked for this particular runner. My primary goal for doing shoe reviews is to reduce injury by educating runners about their foot type and alignment, and teaching them how to apply this to their shoe purchases. I agree that runners need to match their foot type (pronated, wide, etc.) to their shoes and I’m pleased that Altra offers a stability model. I have asked Altra to send me a pair for review. I’ll keep you posted. I have had several runners in my office asking me to evaluate to evaluate their Altra™ running shoes. As much as I want to recommend this shoe, I just can’t. There are too many runners for whom the fit and structure of this shoe is incompatible, as the following video shows. Adidas Supernova Sequence 4 is essentially the same as version 3 — with features like a firm heel counter, inflexible forefoot and non-hourglass midsole/outsole that remain the same. Good for the rectangle shaped foot, that doesn’t pronate excessively and is not too deep as the following field review video shows. One of my favorite trail running shoes for the high volume foot as the following field review video shows. Although the Gel Trabuco is only available in a medium width, it runs wider and deeper than many other brands of trail shoes. In addition to more volume, Gel Trabuco 14 also provides a lot of support, which is important for running on irregular trail terrain. Asics Gel Noosa Tri 7 is a racing flat that features a non-collapsible heel counter, an inflexible forefoot, and torsional stability. Although these features are not typically found in racing flats, they can really make a difference for the midfoot and forefoot striker. The only issue with this shoe is the shape (last) is more C-shaped than rectangular. 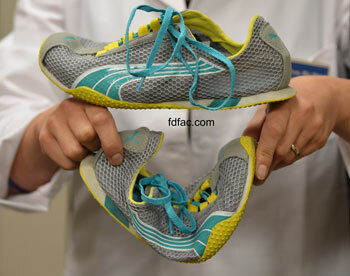 The last shape — coupled with a waist that hourglasses in — can cause excessive pronation in certain foot types, as the following field review video shows. Let me first say that I am not a fan of minimalist running for the majority of my patients. Having said that, “just don’t do it” is not an acceptable directive to runners who are going to run in minimalist shoes in spite of what I recommend. Due to this, I have reluctantly learned to evaluate minimalist running shoes. Not surprisingly, the best way to do this utilizes some of the same principles I use when evaluating non-minimalist styles. First and foremost, does the shoe match the runner’s foot type? Unfortunately, most minimalist shoes only come in medium widths and none are available in narrow widths. This excludes up to 50 percent of the runners who need a narrow or wide width running shoe. Second, does the shoe make the runner’s stride, shock absorption and/or pathology better or, at the very least, not worse? Armed with the answers to these simple questions, my colleague Samantha Gibson, Bsc(Hon) and I have evaluated over 50 models of minimalist running shoes on hundreds of runners with differing biomechanics, pathologies and foot types. Based on this, we have created a minimalist shoe list to give to patients to use as a guide and educational tool. It’s not a perfect list but at least these shoes have our preliminary seal of approval, which is important, given the constraints we are forced to deal with when recommending minimalist shoes. Once a minimalist shoe has been selected, I will evaluate the patient running barefoot, running in the minimalist shoe and running in an appropriately structured shoe. Based on this analysis, I will recommend whether someone is a candidate to wear minimalist running shoes or not. Mizuno Wave Creation 13 is a stable, well-structured shoe as the following field review video shows. This shoe is torsionally stable, has a firm heel counter and an inflexible forefoot making it a perfect choice for those runners who excessively pronate. The generous use of mesh throughout the forefoot makes this shoe lightweight and forgiving where runners need it most. The only problem with this shoe is it runs 1/2 size long based on heel-to-ball length with a correspondingly short toe box, so you will want to be careful when evaluating size. Other than that, Wave Creation 13 is a great shoe.